Daryl has been working as an audio engineer in Saskatoon for close to 20 years. 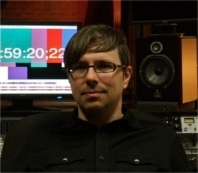 He has worked as a dialog/SFX editor and foley artist on television projects like multi-Gemini award-winning Wapos Bay and Mad Cow Sacred Cow, a Gemini award-winning documentary. Television programs he has worked on have been aired on such channels as The Discovery Channel, CBC, YTV, APTN and SCN. He has also worked on the audio for movie projects (Shadow Puppets) and on radio programs (Randy Bachman’s Vinyl Tap). Daryl’s passion for audio extends beyond just audio for video. He is a multi-instrumentalist, composer, and as an audio engineer/mastering engineer, worked with many musical acts in Saskatchewan. Daryl enjoys teaching students with the “less note taking, more hands-on” approach to audio engineering that RAIS offers.